The fabrics are from Lynette Anderson. I really love this fabric line! Jag tycker att Dina stjärnor är mycket vackra och Du har valt så fina tyger! Ouch! That is FREEZING weather. Your stars are so pretty. Stay Warm! 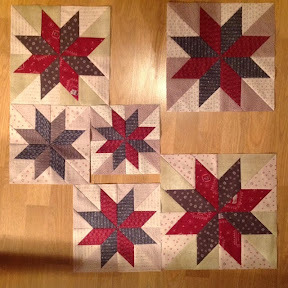 Hello Anne Heidi...you're stars are beautiful, can't wait to see them finished. Bit of a temperature difference- we're having quite a warm day....40 degrees..lol only a 75 degree difference? ?